QUESTION: You seem to be the only person who distinguishes between a “countertrend reaction” and a “reaction”. Can you illustrate the difference? ANSWER: Reactions are typically 2 to 3 units of time regardless of the level be it daily up to yearly. They are part of the “trend” and normally count as part of the trend cyclically. A Countertrend Reaction is a move that exceeds 3 units of time. This is normally a change cyclically speaking and thus is a separate cycle altogether. This can be easily illustrated by the 1989 Crash in Japan. 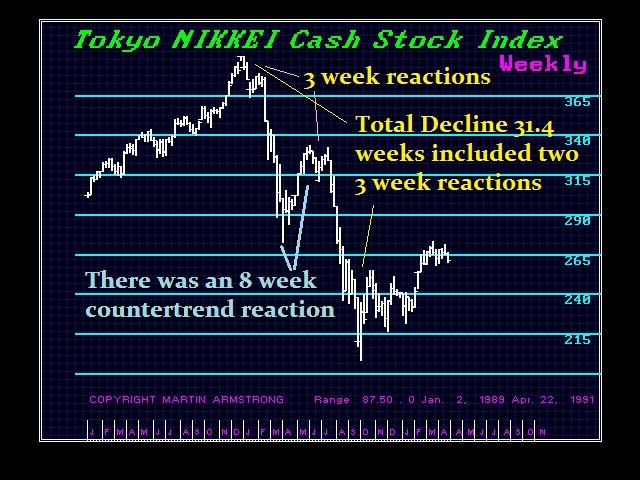 The decline conformed to our Pi Cycle of 31.4 weeks plus the 8 week Countertrend Reaction.